Looking for a Fun Family-Friendly Event in Irving? Get All the Mid-2019 Texas Comic Book Show Details Here! Find Event Dates and Locations: Texas Comic Book Show @ Irving Convention Center, Irving TX, February 2nd and 3rd, 2019. 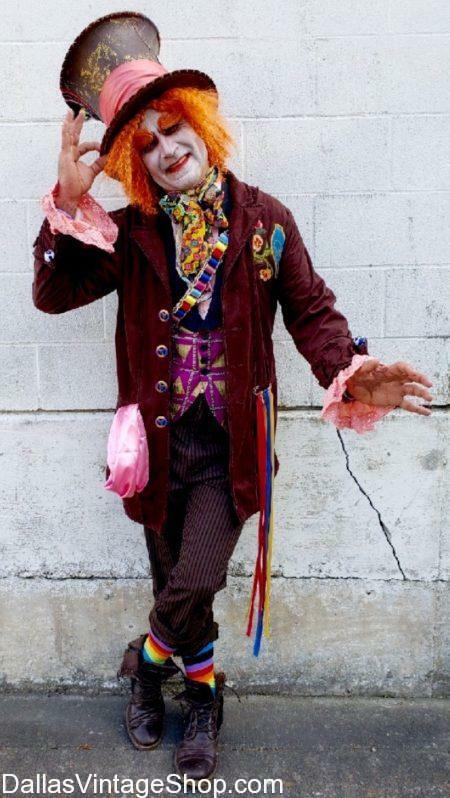 We have Super Cosplay Ideas like this High-Quality Alice in Wonderland, Mad Hatter Outfit and Accessories. Follow Dallas Vintage Shop’s ‘ZYX DFW Costume Events‘ Category for all the cool Cosplay and other cool Costume Events in the Metroplex. Dallas Vintage Shop has DC Comics, Marvel, and X-Men Costumes Available for all Ages and Budgets. “North Texas Comic Book Shows produces a bi-annual Dallas comic book show (Early 2019 and mid-2019) that is a throwback to the early days of comic conventions. Our comic con in Dallas is a great way to meet national comic book artists on a more intimate level. If you collect comic books or are a comic enthusiast, then you will love the large selection of comic books at every event. You will find comic books from the Golden and Silver Ages to current Modern Comics. Thousands and thousands of comic books are available at the Dallas comic book show. Pricing starts at as little as $1. If you are a Dallas area Cosplayer then check out our Cosplay contest. A highlight of our comic convention in Dallas is the contest where Cosplayers are encouraged to act out their characters for a chance at a top prize of $100. Get out your best Cosplay and head to the Dallas comic book show at the Irving Convention Center! There is also a wide selection of toys, action figures, and comic collectibles at our comic cons. There is a good chance that you will find something that you have been looking for at one of our upcoming Dallas comic conventions. A growing feature of our comic book events is local comic artists and creators that set up at the shows. This talented group offers a variety of comic-related art and locally produced comic books. Take some time in the local artist alley to find out more. This entry is filed under 2020 TBA (Q1) Dallas North Texas Comic Book Show. You can follow any responses to this entry through the RSS 2.0 feed. Both comments and pings are currently closed.